Hi guys! So I know today is Thursday, but I am rolling out a new section of the blog - my weekend 4cast. I love to (constantly) read, analyze pop culture, and consider new ideas that don’t always need an entire blog post to unpack; so my weekend forecast will give you the scoop on books I recommend, random thoughts I’m having about current events, movies, fashion, and any other quick ideas/questions that will give you something new to ponder. I also hope this will be a place for you to share your comments and recommendations. And when it comes down to it, I am having so much fun with this once a week is no longer enough =) Enjoy and thanks as always for reading/watching! So many students talk to me about motivation, or rather, the lack thereof. The funny thing is, these students want to be motivated, but it’s just not happening and they don’t know why. 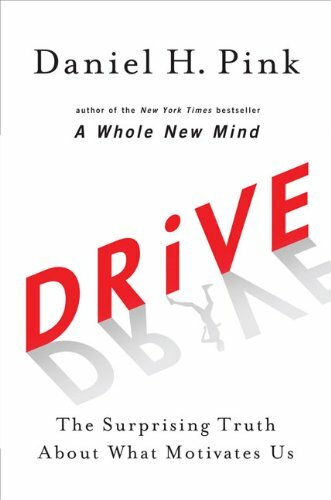 I just finished (and loved) Drive: The Surprising Truth About What Motivates Us by Daniel H. Pink. We aren’t as extrinsically motivated as we think. People are more motivated when the rewards come internally – from a sense of purpose and autonomy. Are your goals really your goals? Getting a good grade or a degree to add to your resume is not what drives those who are truly motivated in college. 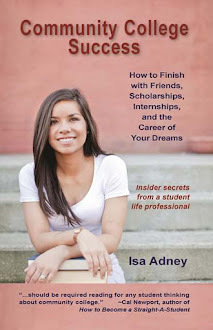 How can college be a part of the bigger goal/dream you have for your life? Has anyone seen Larry Crowne yet? I’m curious to see how they depict community colleges. Please comment below on what you thought if you’ve seen it. There is something about getting a monthly magazine in the mail that makes me feel like its Christmas. It is a monthly reminder that can re-fuel and re-focuse you. Whether it relates to your career, college, or a special interest – it is a monthly reminder to not forget about something you love or something you want to do. Also, one time at a conference where I didn’t know anyone I wore the pendant from Pirates of the Caribbean. I also have the Harry Potter time turner necklace. And it spins! (below are my bloopers/many tries to get the time turner to spin. Or perhaps it is just you going back in time...you be the judge). Have a great weekend and I’ll see you on Monday!